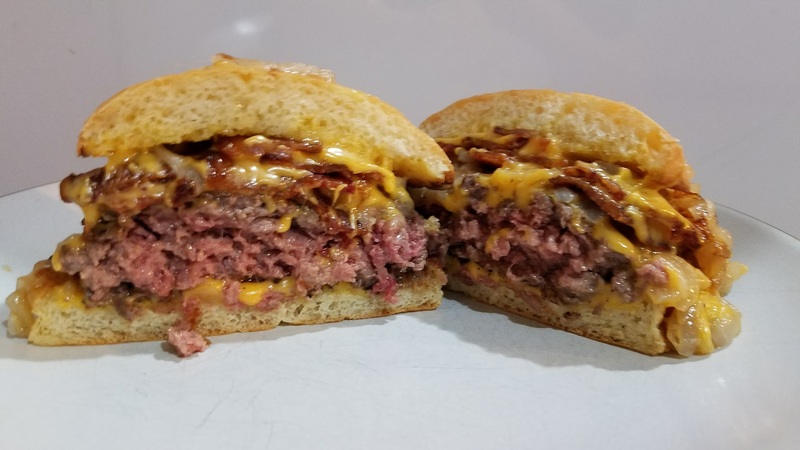 If you want a super cheesy, bacony sous vide burger then this is your jam. Prepping ahead of time makes everything come together in a few minutes. After I got about half way through this I realized it needed some more acid, so I added some pickled peppers. So depending on how meaty and cheesy you like it, you might consider adding some sort of pickle to this recipe. Onions should not be charred, but super translucent and potentially browned. You can cook these up to 5 days in advance. Cover in salt and pepper and then add each patty to a separate Ziploc. Add some oil to a skillet over medium high heat and add the onions and let warm and brown for 3 minutes stirring a few times. Remove from pan. Place bottom bun on plate.